Fully loaded multiple adventure week. Get a taste of canoeing, hiking and mountain biking. 4 nights camping at the Yukon Wild Base or log cabin stay for the first 2 bookings, all transfers, canoes, paddels, life jackets, cooking equipment, Mountain Bike, all meals, on trips - 2 person tents, canoe experienced licensed guide. No previous experience is neccessary. However, a good physical fitness is needed to paricipate in activities like canoeing hiking and mountain biking. Participants are always involved in the daily activities. Willingness to learn new skills, and function as a team isimportant. Experience true nature condensed in a one week tour. Try a multitude of activities and see different features of the Yukon. Stay in a real log cabin, but spend a night camping in the wilderness. Learn how to canoe properly and enjoy rivers of the north. Learn how to be comfortable in the outdoors. 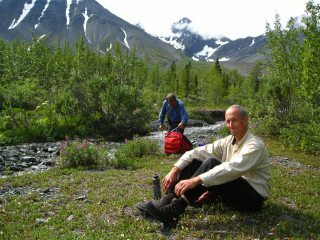 This adventure week is the extract of 20 years wilderness trips in the Yukon. Every day the activity changes. We can cater to you from beginners level to experienced outdoors person. 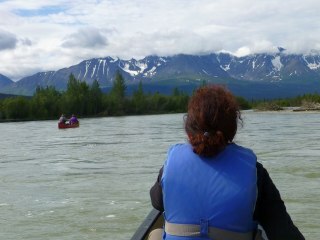 We teach you how to canoe properly and then take you on scenic rivers with spectacular scenery. A well set up camp along the river acquaints you with a comfortable wilderness experience. See spectacular Kluane National Park on hiking excursions. Try a non technical mountain bike ride just for the fun of it. This tour can be an appetizer for more extensive trips in the Yukon or as a preparation for your own self guided Yukon experience. We pick you up in Whitehorse and drive to the Yukon Wild Base. Our log - guest cabin here, will be your base for the next days. Since it is not getting dark this time of the year, we will head out for a late afternoon hike to the Takhini River. After breakfast we get onto the mountain bikes for a day trip through the Ibex valley. Despite some rough, sandy, rocky sections, the good trail is easy to follow. Along blooming meadows and the rugged cliffs of the Ibex Area Mountain, we have lots of opportunities to stop for a break, watch, smell, and take pictures. Dall sheep use to hang out on these steep mountainsides. A side trip to rainbow lake gives us a chance to cool off with a swim in this lake. Some side trips can be taken, if you feel a bit more adventuros. In the evening, back at the base, you get your first theoretical introduction into canoeing. After the initial safety lesson we get into the canoes. On a nearby lake you learn the basic paddling technics. In the afternoon we relocate to the Takhini River. Now you can apply the new aquired skills on life, moving water. The clear, swift water and the superb scenery of the coast mountains compete for your attention. At the end of that day, you should be able to steer a canoe on moving water, keep a straight course or get around obstructions, land properly at the shore, make easy eddy turns, and traverse across the river. Along the way we try to catch some fish, and you can learn to clean them out and prepare them for dinner. We leave our base camp for an overnight canoe trip. This is the time to make use of the skills we just learnt. The Aisihik River with its tight bends, overhanging branches and shallows, is ideal for a start. After a few bends we reach the Dezadeash River. This one is a bit wider and heads towards the Saint Elias Mountains of Kluane National Park. In the afternoon we set up a perfect wilderness camp on a river bank. We will do this step by step, to point out everything important. From starting a campfire, setting up a tarp properly, to a few handy knots; we will cover lot of ground. We might be able to relax in a makeshift sweatlodge and jump into the river. Even in the wilderness, you can enjoy some comforts without bringing your whole household along. The next morning we continue on with the canoes . The river speeds up while the towering mountain range comes within reach. With a lot of new experience we take out in the Village of Haines Junction. From here it is only a short drive to Kathleen Lake, where we set up camp for the night. For a change, we will go on a mountain hike today. From the canoe we already got a good view of the rugged Front Range of Kluane. This National Park contains the largest icefields in the world outside the polar zone. Grizzly bears, moose, and dall sheep are well known inhabitants in that area. A twisty rocky path leads us towards the bowl of King's Throne. If you are brave, we continue on along the ridge to the peak. From here we get a glimpse of the icefields in the distance. Just below us, is the expanse of Kathleen Lake, Luise Lake and Sockey Lake, and in the distance the Dezadeash River. The next day we explore alpine meadows and tranquil creeks. Depending on the season blooming spring flowers or the fall colors dominate the landscape.